When the first frost is about to stake a claim on the season, it's time to prepare warming, comfort food. 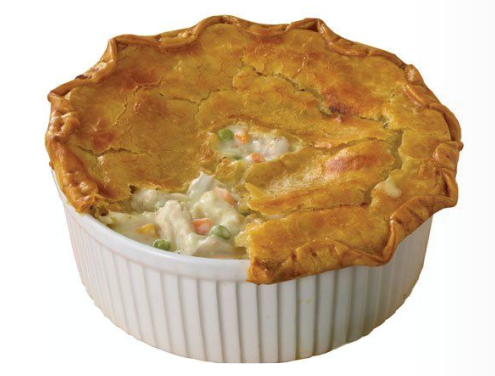 Chicken Pot Pie is the first one-pot-dish that comes to mind. It's probably the single most popular main entrée available at your grocer’s frozen food aisle. Many restaurants will also feature it on their menu this time of year, and one restaurant that comes to mind that does Chicken Pot Pie real well is the Publick House in Sturbridge Massachusetts. It may be the roaring fire and New England colonial ambiance-thing they have going on, especially in Fall, that made that pie taste so good. The wine also assisted. My dear friends Shari Alexander and John Bills took us there when we were taping my TV show in MA. BTW- if visiting the Sturbridge area in Massachusetts, a wonderful place to lay your head for a night or two is The Red Maple Inn in Spencer, Mass., it's in good proximity to autumnal activities like antiquing. Ask about Dinner & A Movie, and Shari's fabulous breakfasts and afternoon tea. But, if you can’t make it to Sturbridge, there’s nothing easier than preparing Chicken Pot Pies from scratch with a 1,2,3 pie dough, or make it semi-scratch by using pre-bought pastry. Other options include; puff pastry, biscuit dough, brioche, or top noodles Dutch-style as you'll find in Lancaster PA.